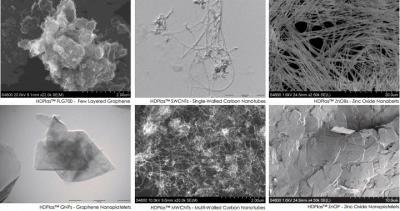 Back in June 2013, Haydale (owned by ICL from May 2011) announced that it developed metal-free graphene-based inks. Haydale, established in 2003 with strong links with Swansea University, is developing and marketing carbon materials under the HDPlas brand. The company currently focuses on graphene, CNTs and zinc nanomaterials. Ray Gibbs, ICL's Commercial Directory was kind enough to update us on Haydale's new inks and more aspects of their business and technology. Haydale developed their own Split-Plasma process to convert mined graphite ore into functionalised graphene flakes (nanoplatelets). This scalable and environmentally friendly method is claimed to be significantly quicker and substantially more cost efficient than other methods. Split-Plasma does not damage the materials and can be controlled to provide appropriate functionalisation levels that are not restricted to the chemical groups associated with other "wet" chemistry processing methods. One of its unique characteristics is that the process can (and has) been used to functionalise synthetically produced graphene materials. Haydale reports that they have supplied graphene materials to over 100 leading research institutions worldwide - and their materials can be used to develop commercial applications in inks, sensors, energy storage, photovoltaics, composites, paints and coatings. Ray says that the key focus appears to be in the flexible printed electronics market. The company currently has low revenues (under $1 million) but they are growing quickly. The company has received over $5 million in funding from private investors since 2010 and have invested over $1.5 million in their "nano safe" production facilities. 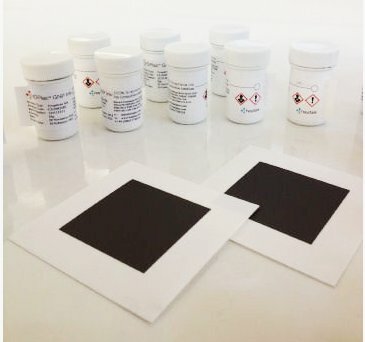 Regarding the company's graphene conductive inks, Haydale says that their inks have excellent performance - with a sheet resistivity of under 10 ohms/sq and a low curing temperature. Those inks were specifically formulated for screen-printing applications but can be adapted to flexographic and gravure printing techniques. While they are not as conductive as silver, they are cheaper and the price is less volatile. It does not oxidize like copper and it will not crack when subject to bending like most metal based inks. The inks therefore lend themselves to flexible printed electronics and with a high surface area can be used in chemical sensor electrodes and give equivalent or improved performance over the industry standard electrode ink. The 100 gram research samples cost £200 ($310 USD) or £2,000/kg while the 5 kg sample costs £2,225 ($3,430) or £445/kg. The price for commercial quantities reduces considerably to under $200/kg. Haydale can produce over 20 tons of graphene ink per year. Ray reports that several large organizations are interested in those inks besides a lot of research institutes. Haydale hopes that products utilizing their graphene inks will appear in the market in spring 2014. Regarding the company's GNPs, Haydale currently offers them in research and industrial quantities (from 1 gram to 100 Kg) and can provide them in dry powder, dispersion or integrated into a polymer system. Finally, I asked Ray about his own view about the graphene market. Ray said that "the key to getting the graphene market going is the supply of quality consistent material at prices that can make a commercial difference, and can achieve performance enhancement either in mechanical, barrier or conductivity properties. To make this happen the material must be matrix compatible and homogeneously disperse - if there are impurities/holes in the materials or inadequate surface functionality (to get a covalent bond) then the user will not switch. Most importantly of all we need a standard definition of what we mean by graphene/few-layered graphene/GNPs/graphite and so on. People sell graphene when it is definitely not single layer and a set of standards will help both buyers and suppliers and provide a comparison which is not available right now - other than (often) price, which is no indicator of performance or quality."